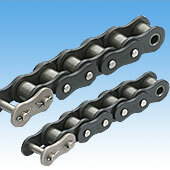 This sideflexing roller chain offers large lateral bending capabilities thanks to its uniquely constructed pins and bushes, and large clearance between link plates. Uses RS Sprockets for easy curved drive. Special oil-impregnated bushes give Curved Lambda Chain long life, even with no additional lubrication. RS standard sprockets can be used.